Our 5 heavyweight indicas are vying to become your couch-lock cannabis champion. All of the contenders are packing a knockout punch that will send you directly to Dreamland. The only question is, which one will reign supreme in your cannabis garden in 2018? When only dank weed will do, you need the highest possible cannabinoid concentrations and healthy levels of terpenes and flavonoids. Our top 5 strongest indica strains are the kind of sticky green that will glue you to the couch within tokes. These heavy-hitters level the playing field of cannabis tolerance for pretty much anyone that consumes them. If you want to kick back, relax, and get stoned with a tasty, aromatic stash, we’ve got you covered. Make no mistake; these are the 5 most deliciously dank indicas you need to get in the grow-op ASAP. Fat Banana is RQS’ badass version of Banana OG, which has already tested in excess of 25% THC in the US. This indica-dominant hybrid is a dank dessert cannabis strain. A creeping couch-lock can take you by surprise and might be too much for occasional tokers. Delicious, dense, banana-scented and flavoured Kush nugs can lead to overindulgence. And serious munchies. They can also turn the novice into a jellyfish. Connoisseurs with a high tolerance will relish this gooey ganja after dark. In the grow-op, Fat Banana is a versatile and compact hybrid. Moreover, Fat Banana can perform well in a variety of substrates. Furthermore, she is suited to a range of cultivation styles from SOG to ScrOG. 8-9 weeks of standard 12/12 bloom and you expect to harvest an extraordinary stash. 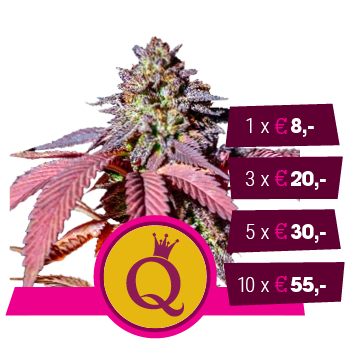 Purple Queen is a hands-on marijuana monarch that will bend you to her will. And you will love her for it. Rare Kush genetics have been selectively bred and stabilised to produce Her Majesty. She is an almost pure indica, coveted for her immense potency and vibrant purple flowers and foliage. Be prepared to go deep, deep into the couch while your head floats off into the clouds. Despite her royal lineage, Purple Queen is far from a diva in the grow-op. She is a classic heavy-duty indica that grows like a bush. Enchanting, chunky purple buds with a shimmering resin coat can be ready for harvest after 8 weeks of bloom. This Kush is loud and some genuine rare dankness not to be missed. Royal Cookies is the best of the Girl Scout Cookies batch brought to you by RQS. Our sweet, sweet, cookies will get you royally baked. Royal Cookies follows the Thin Mint phenotype recipe in the grow-op. Short, branchy bushes ideally suited to the SOG or ScrOG methods are to be expected. After 8-9 weeks of bloom, it’s time to cut some cookies. Chunky nugs will release a biscuit aroma when you break them apart for a whiff. Upon combustion, you will be delighted by sweet, confectionery flavour. Sooner or later, tokers slip into a slo-mo state as her heavy physical effects kick in. Critical Kush brings the immense production of Critical and heavy firepower of OG Kush together. This sticky green monster squashes novices and seasoned veterans alike with her powerful cocktail of cannabinoids. Critical Kush surpasses her parent strains with an unrivalled hybrid vigour and almost narcotic power. Rapid growth and prolific branching with copious amounts of frosty Kush colas are to be expected. Flowering can be just 8 weeks with a typical 12/12 schedule. An old-school mix of rich, earthy, and skunky tastes with a Kush bite gives her a unique yet familiar flavour. Critical Kush is a must for growers of all levels seeking the fattest, dankest stash - fast. Royal Domina is a dank temptress of exquisite breeding stock. By crossing the uber-resinous Black Domina with the exotic Kalijah, this hybrid synergises the best traits of both parents. Royal Domina is the dreamy indica that will delight both millennials and fans of vintage couch-lock cannabis. This strain is heavy on the physical side, but also a very tasty toke. A complex mix of earthy and citrus-sweet notes with a rich hash aftertaste goes down very smooth. Relaxing vibes will course through your body, while the mind runs on safe mode. In the grow-op, Royal Domina can be a very generous-yielding strain with basic grower care and attention. Plants tend to stretch a little taller than your average indica during flowering, usually finishing above 1m. However, with her high flower to leaf ratio, it just makes her that much more productive. Expect to harvest gourmet sticky green in as little as 7-8 weeks of flowering. Many-Coloured Weed - What Is Colourful Cannabis And Why Does It Exist?